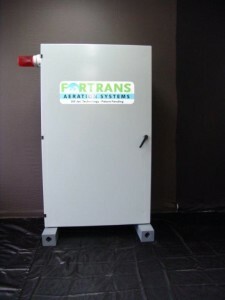 self-contained aeration systems for Aquaponics, Hydroponics and Aquaculture. Dif-Jet™ aerators are located above the water surface distributing aerated water into ponds or tanks. Aerated water may be released at lower depths providing better dispersion and mixing. Aerators may be optionally installed on floatation for placement within tanks or ponds. piping to distribute aerated water to tanks, raceways and ponds. With the Dif-Jet™ design, micro nutrients may be circulated with the aerated water without fouling the aerator or requiring a pre-filter. Liquid chemicals may be added to control other parameters without affecting the performance of the aerator. Dif-Jet™ aerators rarely need cleaning and are designed to provide efficient service for many years. The modular design of the Dif-Jet™ permits easy installation of additional Dif-Jet™ aerators as needed. 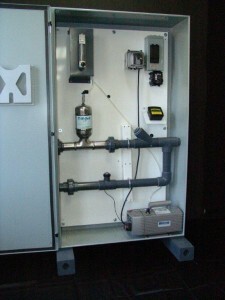 size (CFM) rotary vane air compressor, an enclosure to house the Dif-Jet™ aerator and a 2” diameter schedule 80 pipe treatment loop with electronic water flow meter.